I’d heard a few things about Novikov before I went there for lunch recently but wasn’t really sure what to expect other than it was 2 restaurants in one ( the upstairs being Asian cuisine and the downstairs Italian, along with a Lounge) and that it would probably be full of Russians as it’s owned by a successful Russian restaurauter. 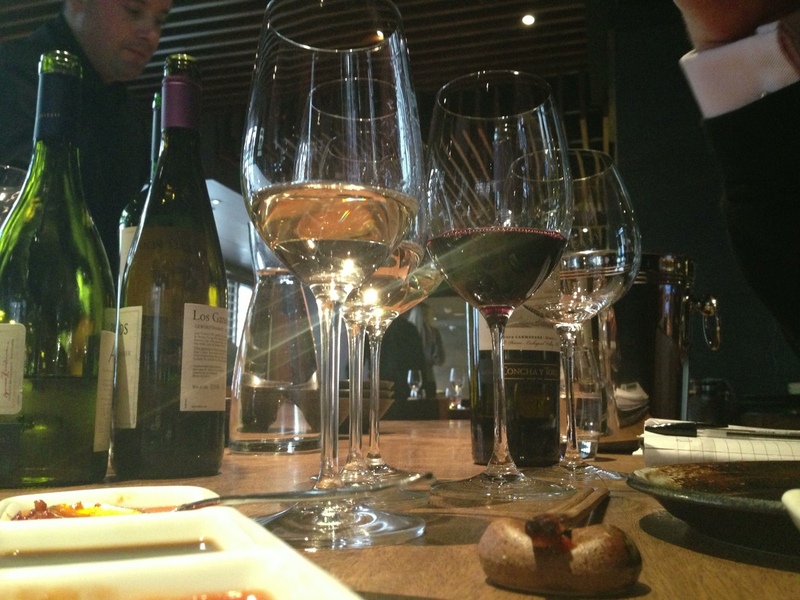 I had been invited to lunch there by the Chilean winery Concha y Toro to sample their premium wines with the dim sum of Novikov. The decor is what I would call modern Asian, lots of dark wood and spotlights scattered around the dining room. 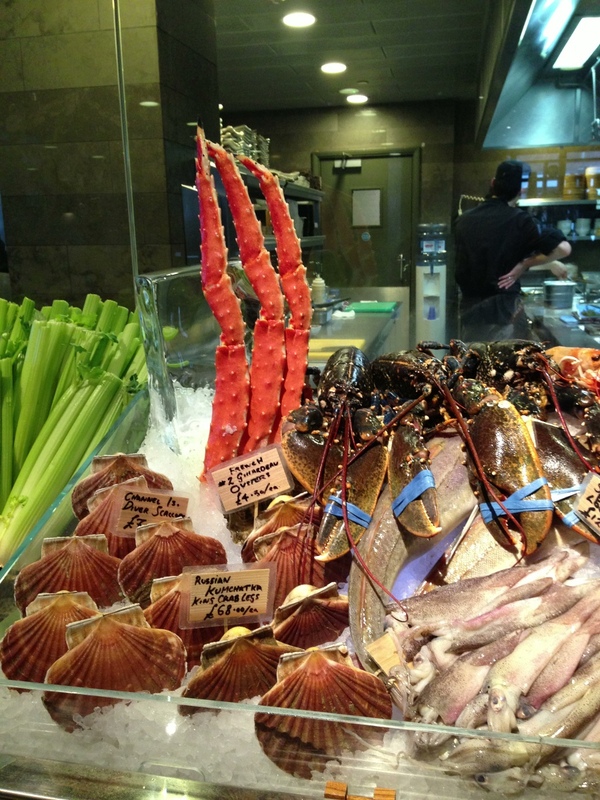 What caught my eye was the long bar of fresh fruits and veg in baskets and seafood on ice that lined the back of the dining room. A glass wall separated that from the chefs who were all busily cooking up a storm. Alvaro, from Concha y Toro was our guide for lunch and he immediately launched into the tasting with a trio of Chilean white aromatic wines. Normally, I wouldn’t automatically think that Chile would produce wines to go with Asian cuisine but CyT have been working hard in the Bio Bio and Casablanca Valleys of Chile to find the best spots for cooler climate varieties. 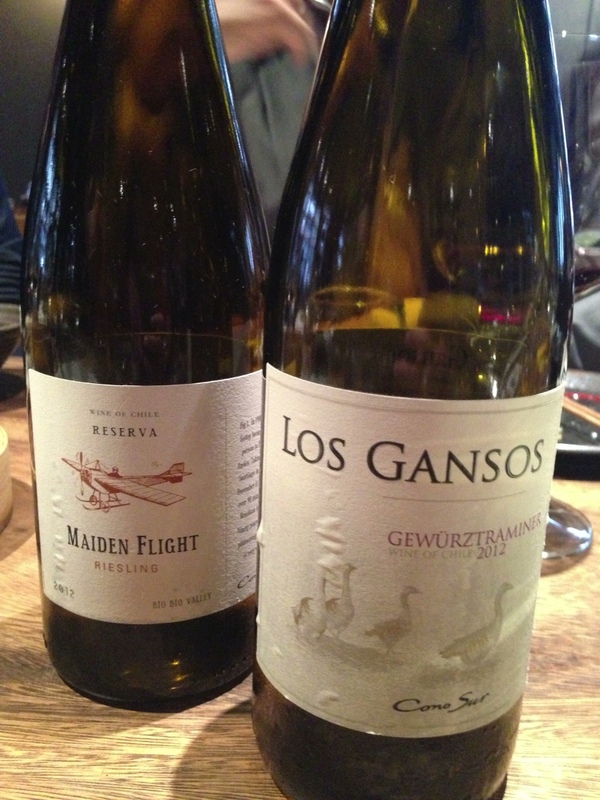 We tried the Maiden Flight 2012 riesling, the Los Gansos 2012 gewurztraminer and the Amelia 2012 chardonnay. The Bio Bio Valley soils (where the grapes for the first two wines come from) are full of calcium and it was apparent in the first two that there was a strong streak of mineral notes running through them along with balanced acidity. The riesling was quite aromatic, honeysuckle, orange blossoms in character with very lots of fleshy white fruit flavours. 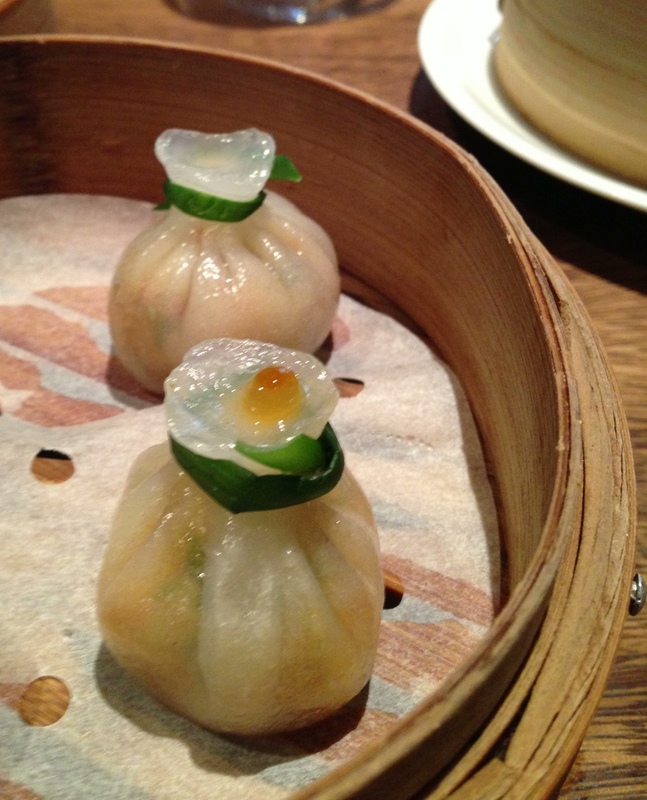 We had a variety of dim sum to pair with the foods. I found the riesling a good match to the spicy shrimp dumplings, the fruit in the wine tempering the chilies in the dumplings. It was also a winning combo with the salmon sushi, the salmon melting in my mouth. I love salmon sushi. The big surprise was the gewurztraminer. I was expecting a typical gewurz with lots of roses and honey on the nose and palate but this had none of that. A floral nose to be sure with white acacia and honeysuckle aromas but on the palate it was dry and spicy with a long citrus finish – very refreshing and morish. It was also a good match for the peanut and mushroom dumplings and the pea and mint parcels – the gewruz not being too sweet but rather complementing the peas. 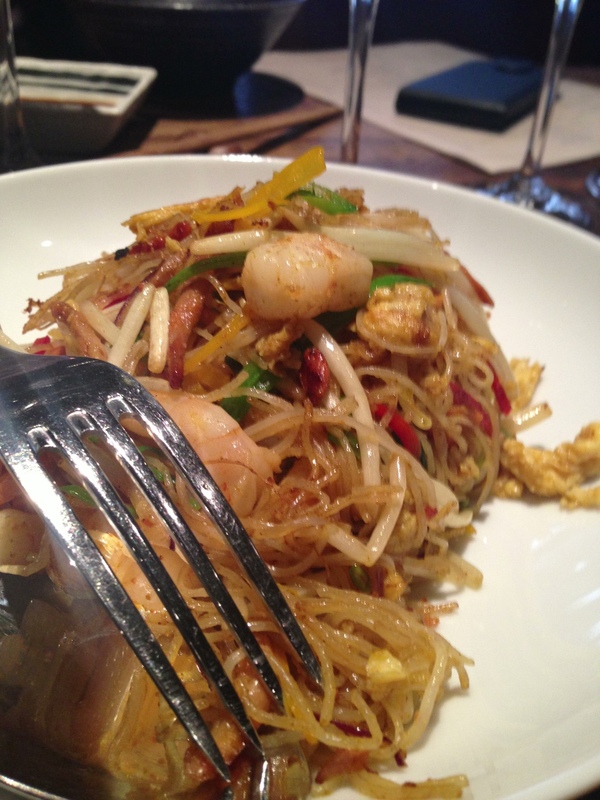 And another surprise, the Singapore noodles also went well with the gewurz, not being chili hot but having a mouthwatering curry kick. The gewurztraminer paired a bit better with the cuisine, having a more weight and less acidity then the riesling. The 2012 Amelia chardonnay is for me a bit too buttery, rich and oaky. It’s definitely made in the New World style and I wish the winemakers would go a little bit easier on it. However, once paired with the earthy mushroom and peanut dumplings, I found the oak tamed and the fruit of the wine able to come out. 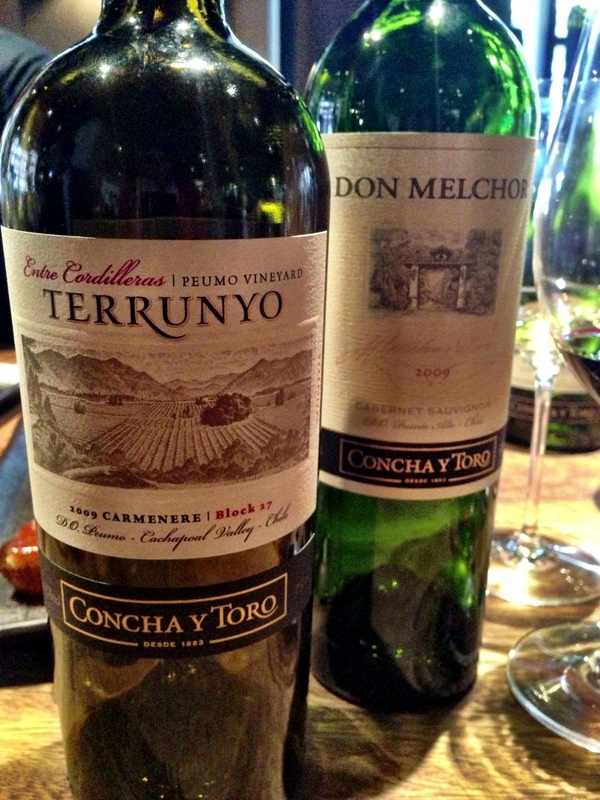 We had the 2009 Don Melchor cabernet sauvignon (one of the flagship wines of Concha y Toro) the Peomo Terrunyo 2009 carmenere with the main course of Peking Duck. 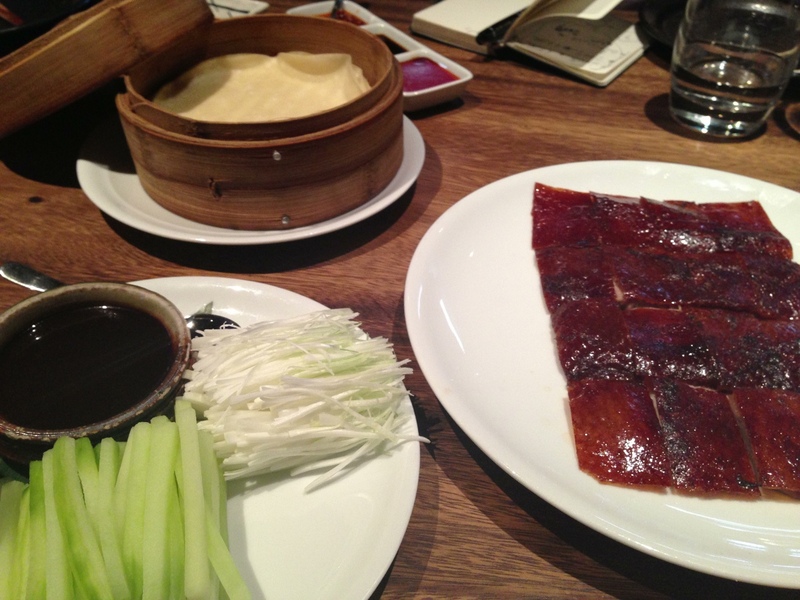 I love Peking Duck and Novikov’s comes with a flat and crispy slab of skin, pounded out into a few millimetres thick. I would think this might be a difficult dish to pair with a red Chilean wine, the plum sauce was my biggest worry, but the Don Melchor with it’s savoury and smooth wine palate, enticing nose of vanilla, sweet spices, cinnamon and toast with loads of sweet ripe, red fruit flavours worked well with the salty and sweet duck. Carmenere seemed to enjoy a bit of fame not long ago but I haven’t had any recently so it was with some curiosity that I tried the Peomo Terrunyo 2009. The aromas of this wine jumped out of the glass, assaulting my nose with lashings of green tomato leaf, tobacco and black fruit. Ripe strawberries and cinnamon followed by a long dark chocolate finish, striking a balance between fruit and acidity, delicious. 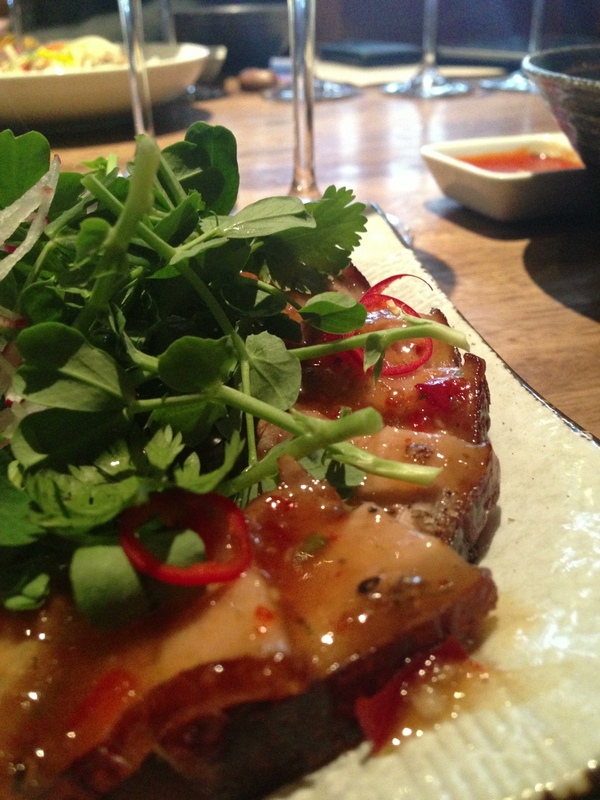 Paired with the duck, it became an austere wine, cutting through the sweet sauce and displaying a savoury character. 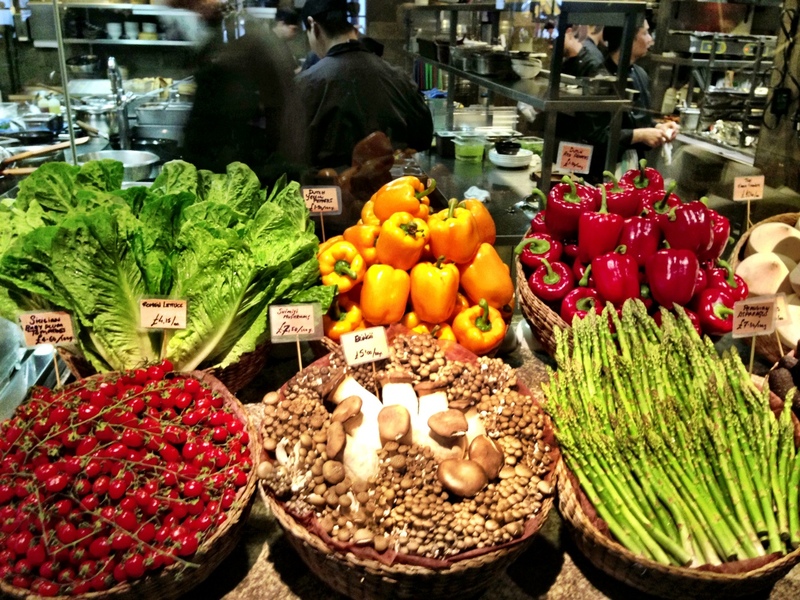 I enjoyed the wine and food matchings at Novikov and wouldn’t hesitate to order Chilean wine if I was dining on spicy Asian cuisine. The aromatic whites having great balance and acidity and the red wines standing up to the often strong Asian flavours that can overpower a wine.